Really big events. How do they do it? Staging amazing events at local venues dates back to at least the 1960s, when the now (almost) world-famous Family Fair was launched on Larchmont Blvd. The Grove and Paramount Pictures play host to a number of equally remarkable achievements. For example, a tribute to first responders and fallen police officers, “Run to Remember,” is set for Sun., Jan. 24. The half-marathon and 10K will take participants from The Grove to a red carpet welcome at the Melrose Ave. studio. 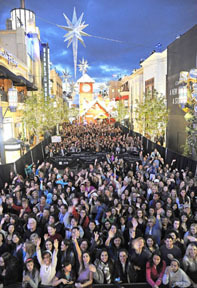 The Grove also recently hosted the finale of “Dancing With the Stars.”While much of the ABC TV show was produced at CBS studios next door, several performances took place on an outside stage at The Grove. As thousands watched from The Grove grounds, behind the scenes the show’s host, Tom Bergeron, the celebrity finalists and the pro dancers were shuttled back and forth from CBS to the Grove in golf carts. When Jane Burrell joined the Los Angeles County Museum of Art 38 years ago, a handful of family and school programs was offered, along with a few art programs and docent-led tours. Today, the senior vice president of education and public programs oversees some 370 programs a year and a 30-member staff. Experts in jazz and classical music, art and film curators and even wine aficionados bring the $2.4 million department to life with talks, tours and concerts. “I make sure all of this comes together. The schedules, budgets, announcements…” said Burrell. Some programs are so successful they move to larger grounds, such as an annual KCRW pie-baking contest now held at UCLA. Retail giant Target offers three free holiday programs a year. Next up is Martin Luther King Jr. Day, Mon., Jan. 18. “It’s a busy day” with more than 10,000 children and adults expected on the museum campus and a Dixieland swing and blues band and dancers on the bill. Being a holiday, there’s ample parking in museum lots and on the street, says Burrell. In the summer, picnickers gather on the lawn to hear the salsa beat during Latin Sounds concerts. Pianists and chamber groups play year round inside the Bing Theater, and a popular Friday night outdoor jazz fest starts up in the spring. Curator-led tours, “Senses of Time,” visit the video and film-based works of Africa Sun., Jan. 17. Museum director Michael Govan will sit down with architect Frank Gehry for the Director’s Series Feb. 11. Art and Music concerts pick up again in March with multimedia guitarist Kaki King. “There’s a lot going on. They’re all wonderful programs,” says Burrell. It’s getting bigger ever year. More than 10,000 came to the Larchmont Family Fair last fall for a kid’s costume contest, Larchmont talent show, rides and small-town fun. Setting up 90 booths, animals and more for the daylong event in the heart of a bustling metropolis is a small miracle. “It’s like a military operation. It’s amazing,” said Fair co-chairman and local dentist Tim Gogan. Beginning at 6 a.m., a 10-person crew begin setting up the booths for 38 charity groups, food vendors and ticket booths. Soon the camels, goats and other pets arrive, and giant bounces, electric mini-cars and more are on the street, which has been blocked off between Beverly Blvd. and First St. The fair had a modest start back in the 1960s when it was held on a Friday night during Labor Day weekend. Dawne Goodwin, the late publisher of the Larchmont Chronicle, came up with the idea of the Fair as a way for charity groups to raise money all at one place. One year, a local plumber in charge of getting the permit, forgot, so the event was delayed to the last Sunday in October. The date stuck. It made sense for the children’s costume contest, but mostly because “the street closed down completely on Sunday,” said Gogan. There were only two restaurants back then, and one was a coffee shop in the Larchmont Medical Building. Gogan’s family had raised Shetland ponies, so in the early years, he arranged the pony rides and a petting zoo. Initially two groups sponsored the event, the Larchmont Boulevard Association, which still oversees the Fair today, and the Larchmont Service Club. “It gets bigger every year. The kids are so excited. They love it,” said Gogan.